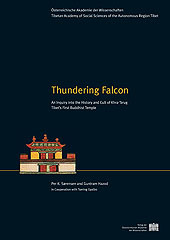 This publication represents the results of a detailed historical-philological and anthropological study dedicated to the history and cult of Khra-´brug or the "Thundering Falcon" temple. It constitutes the first serious inquiry into the location’s history, focusing exclusively on this major religious shrine and pilgrimage site, which, according to the Tibetan tradition, is commonly regarded as the oldest (Buddhist) temple in Tibet. The sanctuary, located in the heart of the Yar-lung Valley in southern Central Tibet, which is the cradle of the Tibetan civilization and erstwhile homeland of the Tibetan kings, was erected in the 7th century during the reign of the emperor Srong-btsan sgam-po (d. A.D. 649). Chronologically the temple may have been built immediately preceding the temple sanctuary of Lhasa, which was erected by the same king, the Ra-sa´i´ Phrul-snang, otherwise known as Jo-khang, and which is famed as the symbolic centre and national sanctum of Buddhist Tibet. The main part of the book is made up of a number of primary sources that deal with Khra-´brug, which are presented here in extensively annotated translations. These include excerpts gleaned from various historiographical works as well as local documents. One of these is a local pilgrims’ guide, Khra ´brug gnas bshad (dating from the early 20th century), which forms the most important source in the book and which is also reproduced in facsimile. Furthermore, extensive surveys that were conducted in situ are presented, gleaned from the wealth of local oral traditions that still prevail in Khra-´brug and in Yar-lung. They deliver significant new insights and thus enrich the data extracted from the written sources appreciably. Together, the source material and its comparative analysis open a door to the fascinating world behind the history of this temple, a vista that, from a modern perspective, allows us to appraise and survey central issues related to politics and religion, as well as a number of arcane cult traditions of the period from the 7th to 20th centuries.